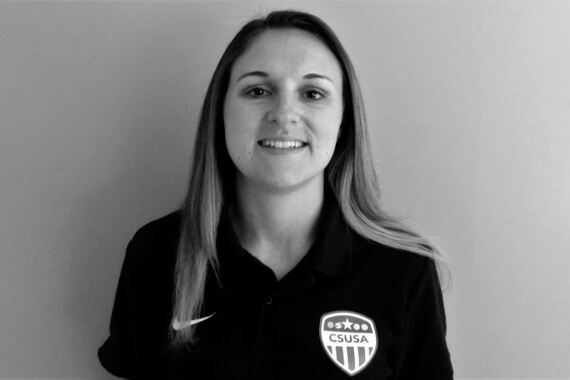 Jessica Fassnidge started working as a Sports Consultant for CSUSA in July 2018 and is primarily working with our UK women’s soccer players out of our Evesham-office. Jessica Fassnidge started her collegiate career at Eastern Florida State Community College where she studied and played soccer for 2 years. During her time at Eastern Florida State she started in all games and competitions and captained the team in her Sophomore season. She was part of the 2012 team that were Runner’s up in the National Junior College final and earned NJCAA all-tournament honours in both seasons. Jessica transferred to Flagler college where she finished her final 2 years of college soccer. During her time at Flagler she started in all matches for both seasons and led the team in minutes during her Junior year. She received MVP and Peach Belt Conference Defender of the week. In her Junior season she also joined and competed in the Indoor Track and Field Team for Flagler. In 2016, Jessica graduated from Flagler College with a Business Administration degree with a minor in marketing. During her time at Flagler she made the PBC Presidential Honour Roll Presidential Scholar and PBC Presidential Honour Roll Gold Scholar. After graduating she stayed in St Augustine Florida to become a Volunteer Assistant Women’s Soccer Coach for a season. Jessica grew up in Worcester where she previously played for a local Worcester Team before going to the States. Playing for my first school Eastern Florida State, we had never previously made it to the NJCAA National Tournament. The first year we hosted the tournament we beat our rivals in the group stages and had to play the current champions at the time in the semi-finals. We were by large the underdogs as Tyler CC were expected to win the game easily. The score was 2-2 and in the last 2 seconds of the game we scored. As my teammate took a shot it went over the keepers head and landed in the net at the exact same time the buzzer went off. We went through to the finals and the goal also made ESPN. All of the fans ran on the pitch, along with coaching staff and entire squad – it was unbelievable.